It’s something I’ve been planning on doing for a while, but feeling a bit burned out on Objective-C / Cocoa and facing a few days downtime over the seasonal holidays now was the time to actually do it. Octopress is nice, and if you are just using the default theme, it’s easy to get up and running fairly quickly. But I found that updating the site for new versions of Octopress was fragile. I actually managed to break the installation, somehow, and that goes some way to explaining why there wasn’t much posted this year. 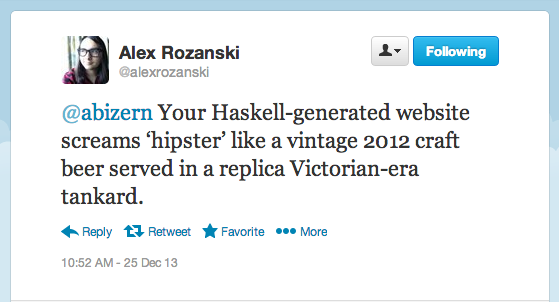 Hakyll is written in Haskell, and takes a little bit of work to get set up. Two things that make this a bit more difficult than normal. But, many people have made their site code public as examples, and this is very useful in getting started. I hope that my source shows up in that list in due course. (Update - it is now!). Despite what some wags may have said on Twitter; it’s not actually that hip.